You may have been a reader here 12 months ago, when I took part in the #write31days project, and wrote a series of posts about blogging. Or maybe you followed along in May, when I blogged every day. What you may not have realised, unless you're a long-time-reader, is that I don't often finish projects like that. So it's pretty exciting that I did actually finish them. The only other time I've finished big projects was back in 2011, when I finished Layout-A-Day, creating 28 scrapbook layouts in 28 days. 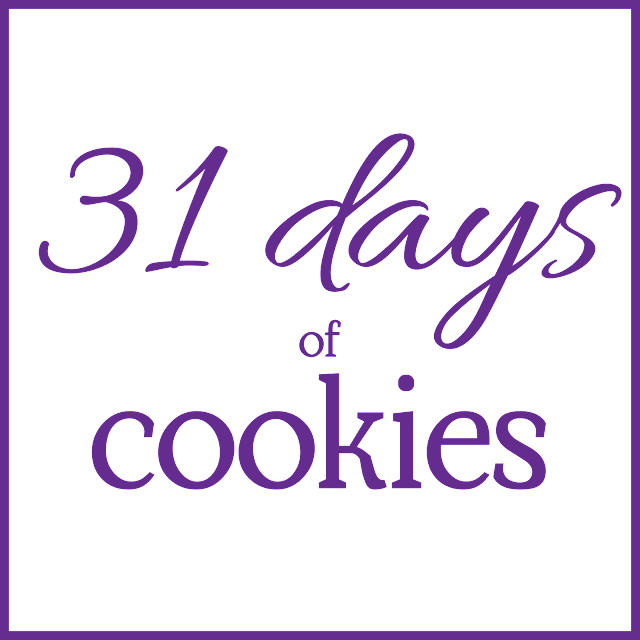 But I have to tell you, choosing to share 31 cookie recipes isn't as easy as it sounds - I forgot about the bit where I have to cook all those cookies! Fortunately, there's plenty of people around us available for taste testing, although I have yet to have a batch that lasts long enough to leave the house, everything has had the kid-seal-of-approval so far! So what delights am I cooking up? There's shortbread and snickerdoodles and oatmeal cookies and slice & bake cookies and even sugar cookies. There's new recipes that I've invented, and tried and tested classics, and new twists on old favourites. And hopefully, you'll find a favourite or two to add to your Christmas cookie list. And if you're writing every day in October, you can join my pinterest board to share your posts. diet schmiet, Christmas is coming! they say write what you're passionate about! I love baking, so it made sense to me! 31 days of cookies - yes please! You'll have to try some of the recipes! someone else needs to eat them besides me! Will look forward to some new recipes! I am only sharing recipes that I have baked myself, that way you know they're going to work. Love this! I actually need some cookie recipe inspiration because I always cook my fail safe chocolate chip cookies. There won't be a choc chip cookie in sight! Great idea Cate. I did follow your blogging every day in May. You did a wonderful job and good luck with this. I have a feeling it will go off! Who doesn't like cookies? What a pity you couldn't put the smell of baking cookies on the Internet. Thank you for following along! Fingers crossed I get all the cookies baked! Ooh we love baking cookies! Looking forward to learning some new recipes in October! I understand what you mean about finishing things. I am great at starting and not so great at finishing things. But I keep on putting myself out there. Good luck with yiur series. It sounds yummy. I found you via #write31days too. Cookies are my weakness! If I bake cookies, they're gone before anyone else can get to them. I'm in trouble! Ewwwweeee! I didn't realize you had done the 31 days. I did too! I saw your challenge mentioned on Melissa's blog and popped over! So very glad I did. I'm going to a cookie exchange party in a couple weeks and I think I'll just grab a couple of your recipes!! Thanks! I WAS a fellow 31 dayer this year and finished! Yay! !